YOU ARE BUYING A NEW SWITCH. 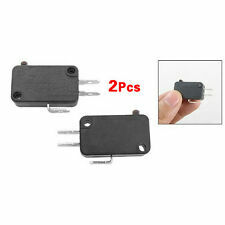 KW11-3Z A31AC1B Mini Micro switch 3pin No. Life>1000000cycles. Dielectric intensity.1000VAC in 1min. ProMatch RapidParts # is 2I3366. Snap Action V4 Microswitch. DB3C-A1AA Cherry / ZF Electronics. Full Data Available if required. 10 Pieces - small switches. 11A 125VAC, 6A 250VAC, 0.5A 125VAC, 1/3HP SPDT Defond Microswitch 8145 UL Rec. 11A 125 VAC, 6A 250 VAC, 0.5A 125 VDC, 1/3HP SPDT Defond Microswitch 8135 UL Recognised. This SPDT microswitch from Defond can be wired for N/O or N/C operation and is rated for 1/3 HP, 125VAC 11A 1/3HP, 250VAC 6A, and 0.5A at 125VDC. Button micro switch 10A, 125V and 6A, 250V A/C. 28mm x 16mm x 10mm body. Catalog: TEND Microswitches. High breaking capacity. Orders under 150 lbs. Orders above 150 lbs. Piscataway, NJ 08854. Piscataway Office. High current microswitch with roller lever actuator, roller is hinged. Manufactured by Panasonic - Part # AM1543KF. 10 A High current switching capacity and high precision. Our Ref: #1405. Microswitch Type : Subminiature. 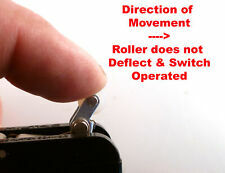 Microswitch Actuator : Simulated Roller Lever. Export Tariff No 85365007. Country Of Origin : JP. Switch Operation : Off-On. Up for sale is a lot of 5x Omron Snap Action Switch. Microswitch Type: Snap Action. 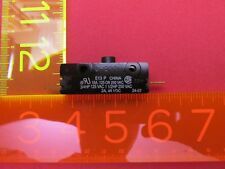 Microswitch Actuator: Spring Plunger. We stand 100% behind our products and service. RoHS Compliant: Yes. Switch Case: Phenolic.